So, there’s a dark horse contender in our school search. It’s only a dark horse because it’s outside of our school district, and quite frankly, an SAISD family fleeing to Northside is about the oldest trope in the San Antonio conversation. Though the school I’m about to write on is a Title I school, with a higher rate of economic disadvantage than the diverse by design schools to which we are currently applying. So it’s not classic white flight in that sense. But, after discussion with my very principled husband, I’m still 99 percent certain we’re going to invest our attendance where our tax dollars go (so the district can actually get those tax dollars). However, indulge me for a moment while I share my love of Colonies North Elementary, the school that transcends districts, cities, and countries. Anyone who has ever “picked my brain” about schools knows that I have loved Colonies North Elementary for a very long time. From the first time I read the press release for their yearly Parade of Nations. And immediately began reporting for this story. Colonies North educates many, maybe most?, of the elementary-age refugee children resettled by the U.S. Government through Catholic Charities here in San Antonio. It varies year-to-year but the school usually has over 40 different countries represented, and over 30 different languages spoken across the student body of 700ish (give or take 50). 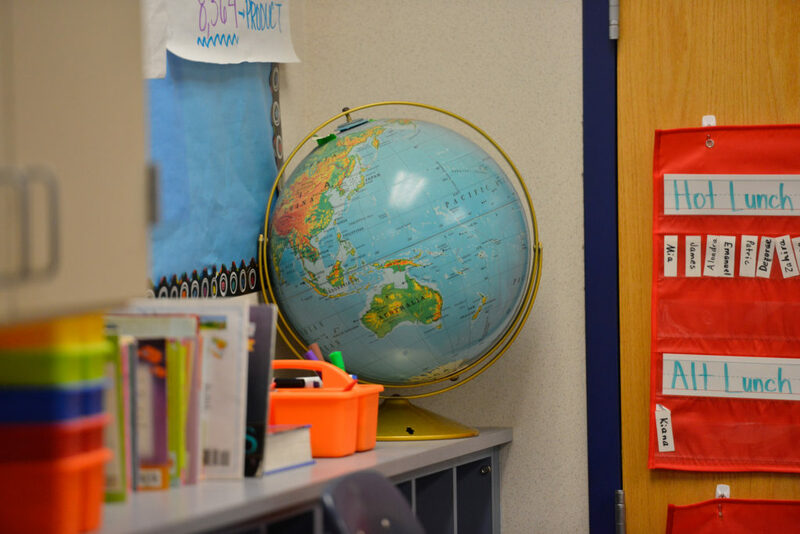 The newcomers, as they are called, are integrated into the “regular” classrooms as soon as they are able, beginning with one or two classes, until they are able to fully integrate. For some, this is a quick process. They come with some English already, thanks to formal education or professional parents who are fleeing relatively recent outbreaks of violence or threats against the family. Some of the parents were U.S. contractors in Afghanistan, Iraq, and elsewhere. Others take more time to adjust to formal schooling. When students have grown up in refugee camps, such as the Rohingya students or those whose parents fled the Democratic Republic of Congo, they have a steeper learning curve. They spend longer in the newcomer classrooms, like the one where Sarah Aguirre taught for years. Aguirre is now at UTSA working in the Center for Inquiry of Transformative Literacies, another partner of the newcomer program. She’s still, however, a Colonies North parent. Like us, Aguirre’s family prioritizes diversity. Not only for the feel-goods, or even just the “raising good humans” aspect of it, though that is a huge part. She sees comfort with diversity as a huge advantage to her kids who will likely work in a globalized market. While one of the goals of the newcomer program is to help the students learn to function in the U.S.—families are given six months to settle in, students are given two years of newcomer services in the schools—Colonies North is not about the business of erasing what came before. DanCee Bowers supports the school’s celebration of students’ home cultures. If people took time to appreciate them, she believes, the anxiety around assimilation would ease. “We’re only comfortable with people who come here if they’re going to do what we do,” Bowers said, and we’re missing out. She would know. Colonies North had a profound impact on Bowers own worldview. Bowers went to Colonies North as a child herself, when it was primarily white and suburban. As the daughter of a single mom in the 1970s she found camaraderie with the school’s one black student. They were unlike the others. That was what diversity meant to her, and she went on thinking of herself as “open-minded,” she said. Bowers served in the military, stationed in the Middle East. Again, she never thought of herself as racist, but when she came back to the neighborhood where she grew up, she encountered a woman in a full burqa. Her reaction, she admits, was not what she wished it had been. “I hadn’t realized how much the neighborhood had changed,” Bowers said. Her military experience had given her particular kinds of exposure to some aspects of some Muslim cultures, but she wasn’t prepared to have those same cultures in her neighborhood. Bowers inherited her mom’s old house, and enrolled her kids in Colonies North. There again she was confronted with this new, intensified diversity. Some parents balked. The attendance zone for Colonies North has been heavily harvested by private and charter schools. Bowers didn’t see a better choice for her kids, so she dove in. She got to know the newcomers and their families, started volunteering and serving the school however she could. Once she educated herself, she said, her fear of the Other dissolved. She wishes other parents, those who leave the school over their discomfort, would do the same. Of course, a school needs a few things in addition to social strengths. Colonies North PTA president Kathy Mochel wasn’t necessarily looking for the United Nations of elementary schools. “I really did push for private school because I wanted that warm cozy small environment,” Mochel said. Her husband convinced her to try the neighborhood school, and she found exactly that. Small classes, tight knit community, and tons of support. For her, the cultural education is a bonus. Also, no homework. Bowers, Mochel, and Aguirre all said their students benefitted from the differentiated instruction they get at Colonies North. They have kids who are driven to excel and kids who are looking to coast. Each, they said, has been well served. Teachers are trained to meeting each kid where they are academically, so the newcomers can be just another kid in class. The moms I spoke to all heard rumors of the English language learners “diluting” the instruction in classes, but none have seen it. While reporting on a different story, I’ve been keeping an eye on Facebook groups for parents at a variety of San Antonio area schools. Inclusion of English language learners and students requiring special education accommodations really irks parents. Which, in turn, irks me. And brings us to today’s soapbox. You’ve been warned. Nothing makes middle class parents throw off our thin veneer of tolerance like the vague suspicion that our children are being inconvenienced at any point during their school day. It interferes with the competitive grooming and sheltering from any struggle that might accidentally result in emotional growth. As though our children are show ponies getting ready to prance around the ring in front of Ivy league admissions officers when we all know they are just going to come home and use our professional networks to get a job anyway. Give me a break. You can keep your anxiety and neuroses, and the sense of abandonment children sense when they feel like their acceptance is tied to their performance. I’m going to try to find a better option. And that’s why I’m bullish about Colonies North. Because you can’t create a special curriculum that’s better than the peer effect, and Colonies North has the most unique peer effect in the city. Nothing will serve my children better than resilience, and that’s what they’ll learn from sitting in class with refugees. And if you want to talk about values…those are my secular values. Radical hospitality, patience, empathy, cultural and personal humility, and grace. I’m sort of gobsmacked that other parents would pass up this opportunity, but enough are willing to do so that Colonies North has become the overflow campus for Northside. Classes there are allowed to stay small so that they can receive overflow students throughout the year. Which may open up the door for the McNeels. Again, I’m *pretty sure* we’re staying with SAISD on principle, but if this were an option in our district, it would be my first choice.